Two doctoral candidates at New Mexico State University are among 13 students in the country selected to receive NASA Harriett G. Jenkins graduate fellowships, providing each student with more than $50,000 in annual funding through the completion of their dissertations. 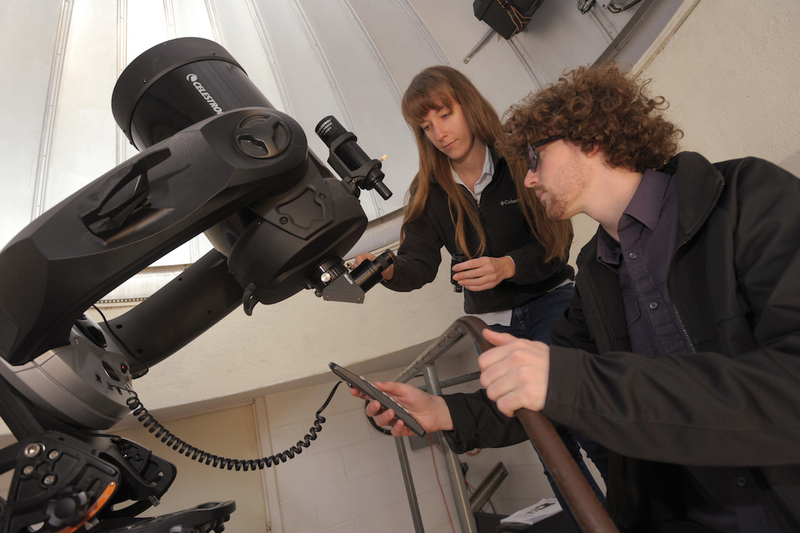 Kathryn Steakley and Alexander Thelen, both third-year doctoral candidates in the Department of Astronomy in the College of Arts and Sciences, were chosen for this graduate fellows program, which focuses on improving and diversifying NASA’s future Science, Technology, Engineering and Mathematics (STEM) workforce. Along with financial support – which includes a 10-month stipend, tuition and fees – each fellowship offers an annual 10-week in-residence summer research stay at a NASA center. Steakley will conduct her research stay at NASA Ames Research Center under the mentorship of Melinda Kahre, who received her doctorate from NMSU in 2006. Steakley’s application research proposal, titled “Exploring impact heating of the early Martian climate,” will focus on the climate conditions on Mars that were necessary when apparent water-carved channels were created several billion years ago. Steakley will use atmospheric computer models to simulate these conditions and investigate how the existence of these processes may have enabled the formation of surface water flow features. Thelen will spend his research visit at NASA’s Goddard Space Flight Center working on his project, “The chemical history and evolution of Titan’s atmosphere as revealed by ALMA,” under the mentorship of NASA research assistant Conor Nixon. Thelen’s research project uses the newly completed Atacama Large Millimeter/Submillimeter Array (ALMA), located in Chile, to probe the atmosphere of Titan to learn more about its atmospheric chemistry. As part of this fellowship, Thelen and Steakley attended the Southern Regional Education Board’s Institute on Teaching and Mentoring conference last semester, in Arlington, Va. There, they met Charles Bolden, the current administrator of NASA, attended sessions on how to be successful in a doctoral program and were introduced to the other Harriett G. Jenkins fellows and alumni. This entry was posted in Proposal news and tagged graduate students. Bookmark the permalink. Follow any comments here with the RSS feed for this post. Both comments and trackbacks are currently closed.